The new A7 gets a wider trapezoidal grille and thinner LED headlights. NEW YORK -- The A7 has become Audi's secret weapon for attracting new customers, according to the automaker's head production manager Anthony Foulk. Audi gave its second-generation Audi A7 a public debut at the Detroit auto show on Monday. The coupe-styled sedan is aimed at buyers looking for space and sportiness in one model. Foulk said the A7 is for a "more emotional buyer." Customers are attracted to its versatility as a car with space for sporting equipment and luggage that also looks good for driving to special occasions at night. "People come to Audi for the A7," he said. "They cross shop it against the [Porsche] Panamera, the Tesla [Model S]." The sloped roof, angular grille, and broad sides of the car continue the design language Audi introduced with the A8 sedan last year. They also continue the precedent set by the first-generation A7 model that debuted in 2009. At peak annual sales, Audi sold 8,500 A7s compared with 6,500 A8s globally, Foulk said. While much of the interior work on the new version of the A7 remains the same as the previous version, new this year are full-length LED taillights, a wider trapezoidal grille, thinner LED headlights, and larger openings in the lower front fascia in the S Line variant. The headlights and taillights also have a diverting feature which causes them to dance like lasers at a concert when the vehicle is locked or unlocked. The A7 embodies the latest of the increasing number of grand turismo- and coupe-like vehicles in the luxury segment today, including the BMW 6-series Gran Turismo. Intended to combine the spaciousness of a sedan, the versatility of a hatchback and the beauty of a coupe, it carries on where the successful A5 Sportback left off, with more space inside and additional luxury accoutrements carried over from the larger A8. While the front signature grille impresses with its LED headlights and angular corners, the massive hatchback rear trunk has room enough to fit at least one bicycle and a pass-through function long enough to fit skis or snowboards inside the car. "The number-one reason why people choose the A7 is because they like the design" they love the image," Foulk said. "Second, they come for the versatility." 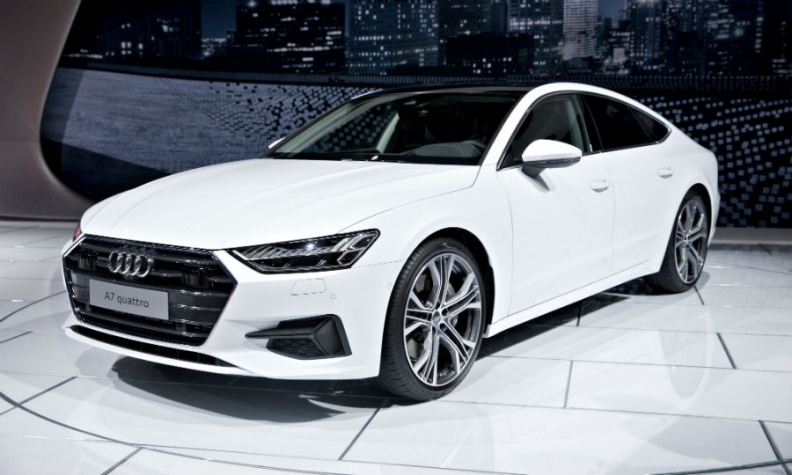 The Audi A7 Sportback will go on sale in Europe will begin in late February at a base price in Germany of 67,800 euros. In the U.S., the model will reach dealerships later this spring, with prices to be announced later.